When filling bags with powder and granules there is a great need for a solution that is hygienic, safe and one that prevents damage of the products. This process on a global level is being automated. This is both due to the working environment to handle powder and granules openly in the work area but also the physical stress of moving heavy bags. The requirement from the industry is going toward safe and hygienic solutions. Available with all material in contact with the conveyed product are in compliance with FDA, EC No. 1935/2004 and EC No. 10/2011. 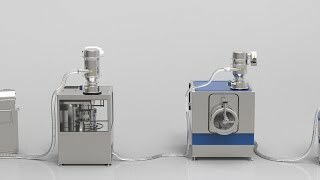 Flexibility in which vacuum source to use, the conveyors works excellent with an ejector pump or with a mechanical pump.